The Belmont BID is set to host its annual FERRAGOSTO festival that draws thousands of visitors from the tri-state area and beyond to the intersection of all-things-Italian at world-famous Arthur Avenue and East 187th Street on Sunday, September 9, 2018. This ancient Roman festival dates back to 18 B.C. when the gathering was created in honor of the emperor, Caesar Augustus. For the past 20 years, the merchants of Bronx Little Italy have banded together to keep this lively Italian tradition alive by engaging visitors in Italian culture, traditions, music and of course, the greatest food. The Ferragosto event continues to grow each year with an average of 20,000 – 28,000 guests who travel from near and far to make it part of their family tradition. Attendees love to explore the Italian culture and experience all the fun, food and music the festival has to offer. Ferragosto is a chance for people to experience first-hand the neighborhood’s old-world charm and tradition of good taste, including our fine-dining restaurants, our hand-made and imported Italian products and so much more. Scheduled to perform this year are: Elio Scaccio & JulieAnna, Natalie Pinto, and Rock Steady. Commedia Dell’Arte will also be performing comedic acts throughout the festival. 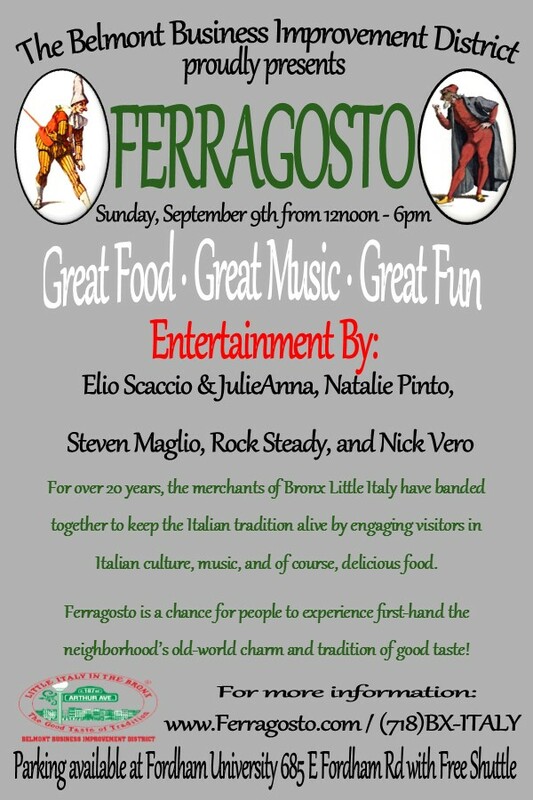 For more information please visit the Ferragosto website.